The potential for wearable electronics goes far beyond smart watches, but our current options for battery packs and circuit boards don't make for the most comfortable E-socks. One solution, being developed by scientists in China, is to simply print flexible fibers on to transitional textiles or clothes. For example, they printed patterns that can harvest and store electricity onto fabrics. With a 3-D printer equipped with a coaxial needle, they drew patterns, pictures, and lettering onto cloth, giving it the ability to transform movement into energy. The advance appears March 27 in Matter, a new materials science journal from publisher Cell Press. "We used a 3-D printer equipped with a home-made coaxial nozzle to directly print fibers on textiles and demonstrated that it could be used for energy-management purposes," says senior author Yingying Zhang, a professor in the Department of Chemistry at Tsinghua University. 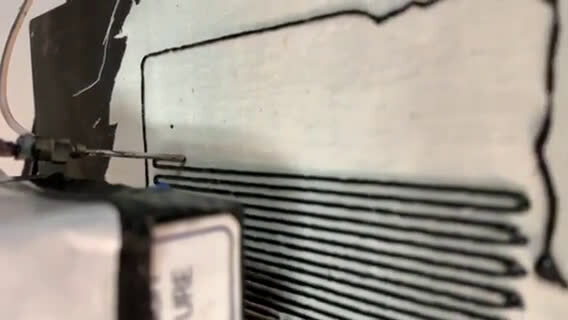 "We proposed a coaxial nozzle approach because single-axial nozzles allow only one ink to be printed at a time, thus greatly restricting the compositional diversity and the function designing of printed architectures." 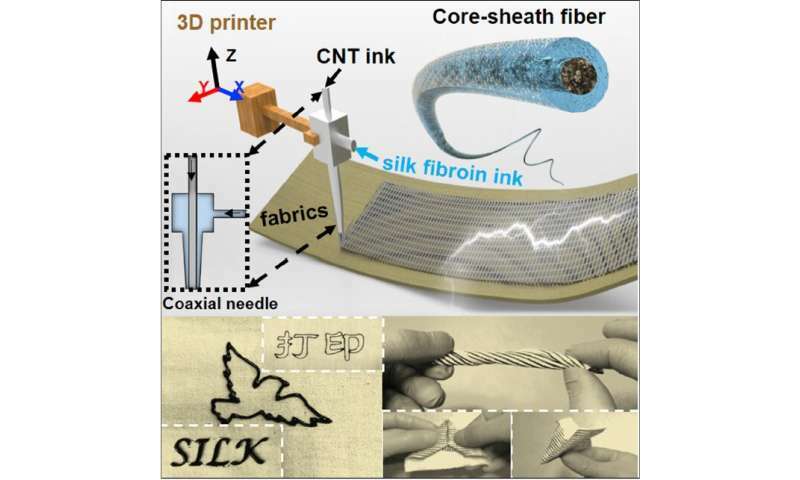 Zhang and her colleagues made their first 3-D printed E-textiles using two inks—a carbon nanontube solution to build the conductive core of the fibers and silkworm silk for the insulating sheath (although other labs could choose materials that adjust for flexibility, biocompatibility, and waterproofness). Injection syringes filled with the inks were connected to the coaxial nozzle, which was fixed on the 3-D printer. These were used to draw customer-designed patterns, such as Chinese characters meaning PRINTING, the English word SILK, and a picture of a pigeon. This approach differs from other groups who are manually sewing electrical components, such as LED fibers, into fabrics, but these multi-step processes are labor intensive and time consuming. The strength of using a 3-D printer is that it can build versatile features into fabrics in a single step. The approach is also cheap and easy to scale, as the nozzle is compatible with existing 3-D printers, and the parts can be swapped. However, a drawback is the resolution of what can be printed is limited to the mechanical movement accuracy of the 3-D printer and size of the nozzles. "We hope this work will inspire others to build other types of 3-D printer nozzles that can generate designs with rich compositional and structural diversity and even to integrate multiple co-axial nozzles that can produce multifunctional E-textiles in one-step," Zhang says. 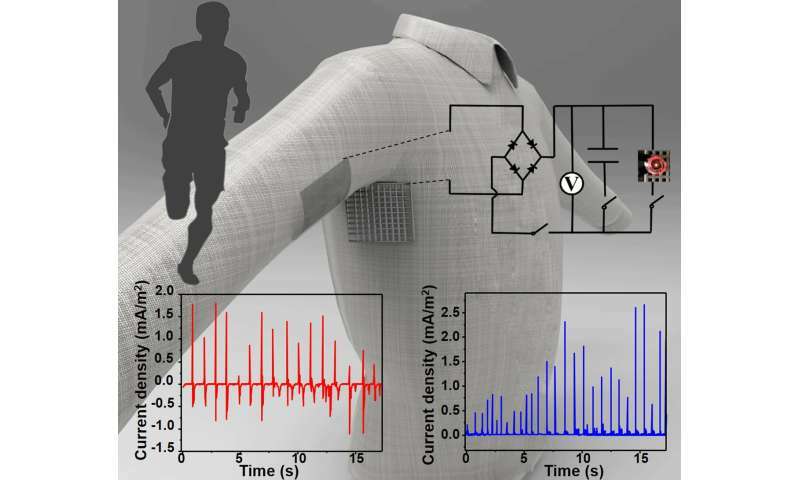 "Our long-term goal is to design flexible, wearable hybrid materials and electronics with unprecedented properties and, at the same time, develop new techniques for the practical production of smart wearable systems with integrated functions, such as sensing, actuating, communicating, and so on." The hype over "wearable electronics" is growing seriously thin after (at least) 20 years.